Canyons is the largest resort in Utah and at 4,000 acres it is one of the largest in North America. 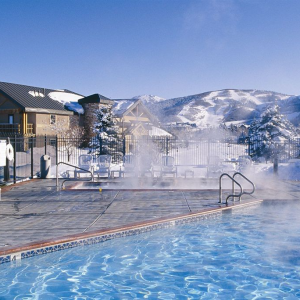 Only 50 kms from the airport at Salt Lake City, the Park City Peaks Hotel of-fers luxurious amenities, including indoor/outdoor pool, hot tubs, sauna, free Wi-Fi, free valet ski storage, and onsite dining at the ‘Upper Deck’ Restaurant. This hotel is centrally located to be less than 10 minutes’ free bus ride from Park City Mountain, Deer Valley and The Canyons ski resorts, with Wasatch Mountains views. Also a short bus ride from the Historic Main Street.